An extreme example of how durable and insulated a cooler can be, Yeti Coolers’ Tundra 75 is constructed from one-piece, roto-molded polyethylene which is extremely durable as well as dry ice compatible and UV resistant. 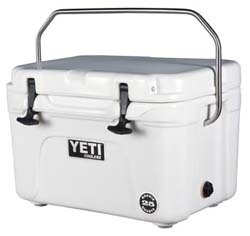 There is a minimum of 2-inches of YETI’s polyurethane foam throughout the cooler body (3-inches in the lid), providing superior insulation while the freezer-style sealing gasket locks in the cold. Failsafe T-latch keepers are molded into the cooler body and a full-length, self-stopping hinge can’t hyper-extend and break. Padlock holes are molded into cooler body and lid and non-slip, non-marking rubber feet help keep the cooler where you put it. Other features include nylon rope and textured grip handles to make carrying easier, a recessed drain plug and rubber washer guarantee leak-proof reliability, and tie-down points are molded into the cooler body for solid mounting. MSRP: $399.99. A little larger than the Tundra 75, the Tundra 110 is another extreme example of how durable and insulated a cooler can be. Features start with one-piece, roto-molded polyethylene construction which is extremely durable, as well as dry ice compatible and UV resistant. 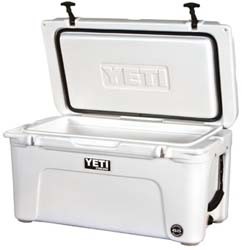 There is a minimum of 2-inches of YETI’s polyurethane foam throughout the cooler body (3-inches in the lid), providing superior insulation while the freezer-style sealing gasket locks in the cold. Failsafe T-latch keepers are molded into the cooler body and a full-length, self-stopping hinge can’t hyper-extend and break. Padlock holes are molded into cooler body and lid and non-slip, non-marking rubber feet help keep the cooler where you put it. Other features include nylon rope and textured grip handles to make carrying easier, a recessed drain plug and rubber washer guarantee leak-proof reliability, and tie-down points are molded into the cooler body for solid mounting. MSRP: $449.99. The Roadie 20 is an ideal cooler for the fly angler who wants portability as well as durability in his or her cooler. Features start with one-piece, roto-molded polyethylene construction which is extremely durable, as well as dry ice compatible and UV resistant. There is a minimum of 2-inches of YETI’s polyurethane foam throughout the cooler body (3-inches in the lid), providing superior insulation while the freezer-style sealing gasket locks in the cold. Failsafe T-latch keepers are molded into the cooler body and a full-length, self-stopping hinge can’t hyper-extend and break. Padlock holes are molded into cooler body and lid and non-slip, non-marking rubber feet help keep the cooler where you put it. Other features include nylon rope and textured grip handles to make carrying easier, a recessed drain plug and rubber washer guarantee leak-proof reliability, and tie-down points are molded into the cooler body for solid mounting. MSRP: $199.99. Click here to find a Yeti Coolers dealer near you. More about Yeti Coolers on MidCurrent.